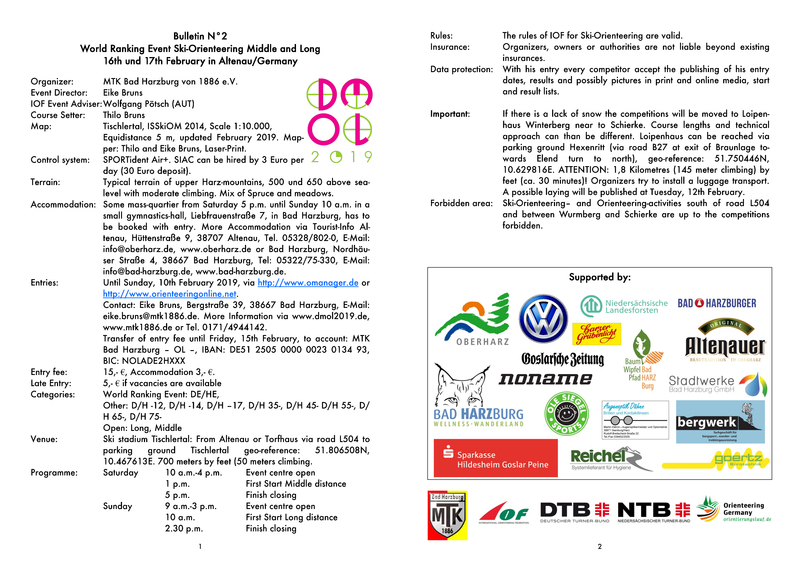 Organizer: MTK Bad Harzburg von 1886 e.V. Map: Tischlertal, ISSkiOM 2014, Scale 1:10.000, Equidistance 5 m, updated February 2019. Mapper: Thilo and Eike Bruns, Laser-Print. Control system: SPORTident Air+. SIAC can be hired by 3 Euro per day (30 Euro deposit). Terrain: Typical terrain of upper Harz-mountains, 500 und 650 above sea-level with moderate climbing. Mix of Spruce and meadows. Accommodation: Some mass-quartier from Saturday 5 p.m. until Sunday 10 a.m. in a small gymnastics-hall, Liebfrauenstraße 7, in Bad Harzburg, has to be booked with entry. More Accommodation via Tourist-Info Altenau, Hüttenstraße 9, 38707 Altenau, Tel. 05328/802-0, E-Mail: info@oberharz.de, www.oberharz.de or Bad Harzburg, Nordhäuser Straße 4, 38667 Bad Harzburg, Tel: 05322/75-330, E-Mail: info@bad-harzburg.de, www.bad-harzburg.de. Entry fee: 15,- €, Accommodation 3,- €. Venue: Ski stadium Tischlertal: From Altenau or Torfhaus via road L504 to parking ground Tischlertal geo-reference: 51.806508N, 10.467613E. 700 meters by feet (50 meters climbing. Rules: The rules of IOF for Ski-Orienteering are valid. Insurance: Organizers, owners or authorities are not liable beyond existing insurances. Data protection: With his entry every competitor accept the publishing of his entry dates, results and possibly pictures in print and online media, start and result lists. IMPORTANT: If there is a lack of snow the competitions will be moved to Loipenhaus Winterberg near to Schierke. Course lengths and technical approach can than be different. Loipenhaus can be reached via parking ground Hexenritt (via road B27 at exit of Braunlage towards Elend turn to north), geo-reference: 51.750446N, 10.629816E. ATTENTION: 1,8 Kilometres (145 meter climbing) by feet (ca. 30 minutes)! Organizers try to install a luggage transport. A possible laying will be published at Tuesday, 12th February. Forbidden area: Ski-Orienteering– and Orienteering-activities south of road L504 and between Wurmberg and Schierke are up to the competitions forbidden.